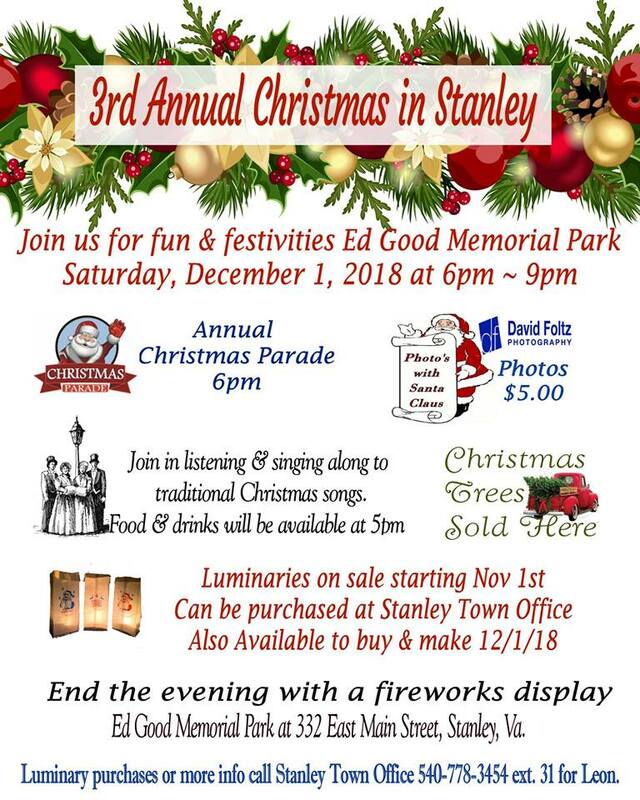 Description: The Stanley Homecoming Fundraising Committee is presenting “Our 3rd Annual Christmas in Stanley”. Come enjoy the Annual Christmas Parade featuring Santa Claus at 6pm. After the parade, join us at the Ed Good Memorial Park where friends and family can sit around fire pits and listen to Christmas Carolers. Santa will also be there for a photo opportunity taken by David Foltz Photography. There will be food and drinks available for purchase, including Elephant Ears as early as 5pm. Presale luminaries will begin on Thursday, November 1 at Valley Exxon & the Stanley Town Office. Bags are $5/each. You may also contact: Rhonda 540-778-1387, Jenny 540-778-3711 or any member of the Homecoming Committee. We will also have luminaries available to purchase on the day of the parade. End the evening at 8:30 pm while enjoying a firework display. All proceeds from this event will help fund the 53rd Annual Stanley Homecoming.